Micromax has launched a new tablet at budget price, the Funbook P255. The device has 7inch capacitive touch screen display. Lava E-Tab Velo+ also comes with similar specifications and features at RS 4699. The Funbook P255 has fair specs considering the price tag. There are many tablets in the market, comes even at more cheaper price but after sale service is not promising. When you buy a branded product , at least you get a good after sale service . The P255 tablet has 7″ inch capacitive touch screen. A 0.3MP front facing camera is placed at the front top-right. At back of the device there is microSD card Slot, 3.5mm audio jack, charging jack and has in built mic. The 2MP rear camera is placed at the rear top-left and loudspeaker is placed at the right side(rear). The tablet has 7-inch capacitive touch screen having resolution of 800×480 pixels (WVGA). The P255 tablet is powered by 1.2GHZ Cortex – A8 architecture processor paired with 512MB of RAM and runs on Android 4.04 ICS operating system. It comes with 2-megapixel rear facing camera and .03 megapixel front facing camera. The tablet has 4GB of ROM (1.15GB available for user) and Expandable memory up to 32GB via microSD card. The tablet is powered by 2600 mAh battery that claims 150 hours of standby time. It features 3G via dongle / modem, WiFi with hotspot, 3.5mm audio jack and micro USB ( OTG ) connectivity. 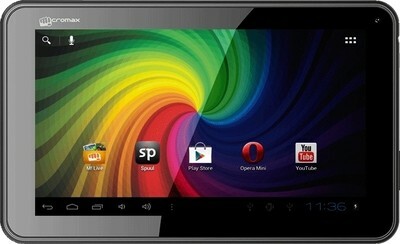 Micromax Funbook P255 comes in Black color. The price of P255 is Rs4999 and you can buy it from flipkart.